Not to be confused with the tangy seafood sauce - although it is believed that the two did share the same plate at one point in history - steak tartare is a preparation of finely chopped raw meat mixed with capers, onion and a variety of seasonings. 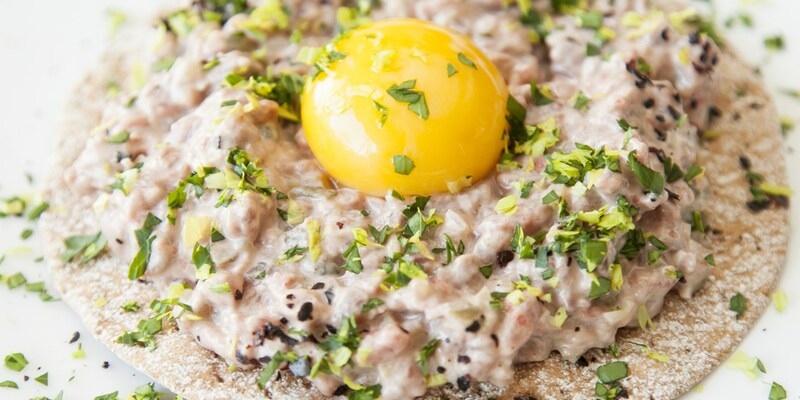 As Tom Aikens' classic Steak tartare recipe demonstrates, the dish is commonly served topped with a raw egg. While tartare is traditionally made with beef, don't be afraid to experiment with different ingredients. James Mackenzie's Venison tartare recipe - served with a haggis Scotch egg - is a true celebration of Scottish produce, while Anna Hansen's visually stunning Venison tartare with gherkin and quail's egg is paired with a punchy umeboshi and yuzu mayonnaise. Fish, too, is a popular variation on steak in a tartare dish. Michael Wignall's Tartare of tuna, puffed rice and compressed mooli makes a fabulous seafood starter, as does Alfred Prasad's Salmon tartare recipe, layering the tartare with beetroot and avocado for a striking and colourful finished dish.